Nearly two and a half years ago I invited Markus Kerber, the then head of the BDI, the German CBI equivalent, to come over, meet our members and tell them what he saw as the way forward. Justin Webb came to our office to interview him for the BBC ‘Today’ programme. His prescient advice as someone who represented the might of German industry but who had worked many years in The City? The 27 would not be divided, special “bespoke” deals were not going to be on offer and the UK had to realise it was completely out, start with a clean sheet and look to what would be plentiful Teutonic pragmatism, goodwill and mutual interest to build a new relationship before the exit date that would ensure minimal disruption to trade for all. One can only reflect on where we’d be now if the UK had gripped that common-sense reality as the starting point and HMG and business sector representatives had not drawn early battle lines and instead worked much more effectively together, sector by sector, to assess and address the major issues. Meanwhile, back in the real world, much is going on and will continue to go on regardless of Brexit. An excellent event held by the UK-Vietnam network at the House of Lords, at 7pm right in the middle of ‘the meaningful vote’, reflected what we hear time and time again from missions in London; that there is a long and valued relationship with the UK and, regardless of Brexit, massive trading opportunity across a range of sectors. Vietnam specifically has a population of 100 million, repeated 6% + growth, an excellent Ambassador and opportunities in infrastructure, education, business services. Strategy and its members will visit later this year. Also, at the same time as the Commons were busy on the ‘meaningful vote’, Strategy International hosted the impressive DFID Permanent Secretary, Matthew Rycroft, for a very engaged discussion around how, with the 0.7% supported across the political spectrum, the UK can maintain its position as a development aid “super power” beyond Brexit. There was active debate on how to deploy funds with the primary aim of reducing poverty but also to see them work in the national interest. As part of this, DFID are looking to enhance engagement with the private sector, both via its own, direct channeling of ODA funds but also increasing cross-government ODA spend. This desirable objective is, however, up against what participants felt were increasing costs of doing business with DFID. There is no quibble with the need for transparency, to deliver value for money and be accountable to the highest standards but the commercial relationship has to be a sustainable one. On Wednesday RUSI’s Director General, Dr Karin von Hippel, took us away from the Westminster parallel universe to that of ‘The Donald’; one where a wall may not be a wall and where American taxpayers find that they are in fact the ‘Mexicans’ who will pay for it (once government re-opens for business). One can’t deny the apparent short-term effectiveness of some of his strident positions but at what level of erosion of the US’s influence? The main issue is one of leadership style. If it’s repeatedly obvious in any hierarchy that only the boss’s opinion matters and criticism, however constructive, is repeatedly and publicly rejected then it descends into conformist group-think that does nothing until he decides. 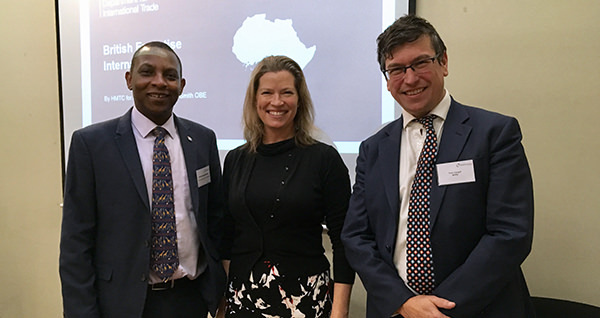 HM’s Trade Commissioner for Africa Emma Wade-Smith visited on Thursday and led a candid and constructive discussion on how HMG engagement in Africa is evolving. This covered the challenges and opportunities UK businesses face doing business in different countries and practical ideas for improving and fine tuning the support businesses receive from the UK government. Particular areas of specific follow up? More coordinated UK engagement in East Africa and integrating the important role of CDC more effectively within wider HMG engagement in the region. The upcoming UK-Africa Investment summit previously announced by the Prime Minister was also flagged as a great opportunity for members to engage early to shape a key initiative for the UK and Africa in 2019. We look forward to a great programme for the rest of January, the remaining events being listed below. Wishing you all an enjoyable and Brexit-free weekend. Why is Russia doing so well? A new international order. How profound is the change?